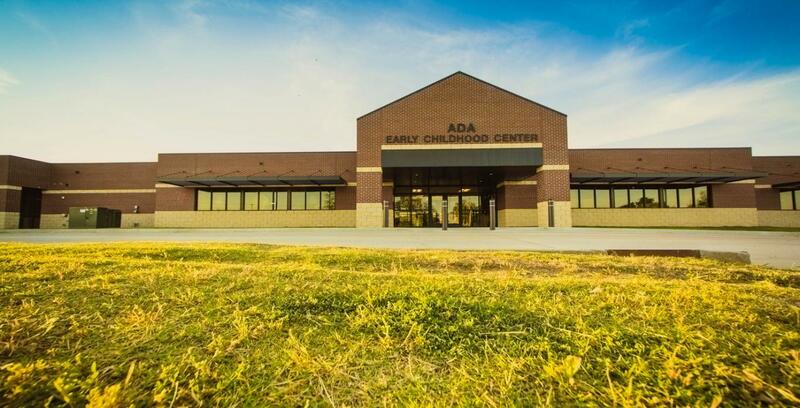 Ada Early Childhood Center offers a full day Pre-K and Kindergarten program based on the Oklahoma Academic Standards for reading, math, science, social studies, and visual arts. Students also participate in physical education, music and library science programs. Instruction is whole group and center based and offers developmentally appropriate activities for early childhood learners. Students also participate in STEM activities in the STEM iLab. This offers students the opportunity to explore careers and participate in critical thinking activities which support STEM instruction. Intervention services are provided for students who need instructional support. AECC also offers a program for developmentally delayed children age 3-5 years. AECC is very proud to be recognized as a "Leader in Me" school. Students learn about the 7 Habits of a Happy Kid. These basic life principles teaches students the importance of being in charge of oneself, making and implementing plans, putting work before play time, thinking win-win, learning to listen, working together and taking care of themselves. The teachers use innovative and engaging activities for students to practice and learn these very important life skills. Ada Early Childhood Centers mission is to strive to ensure student success through quality education by fostering a relationship between families and the school. AECC accomplishes this through many parental engagement opportunities. Parents are encouraged to participate in their child's education through weekly CougaRallies, Read with Mom and Dad days, Math Mondays and seasonal programs. Ada Early Childhood Centers vision is to Strive to be THE school where students feel successful, experience the joy of learning, and know they are safe, cared for and valued. The faculty and staff at AECC work diligently each day to make that vision a reality.